My September update – new home :-) new adventures? 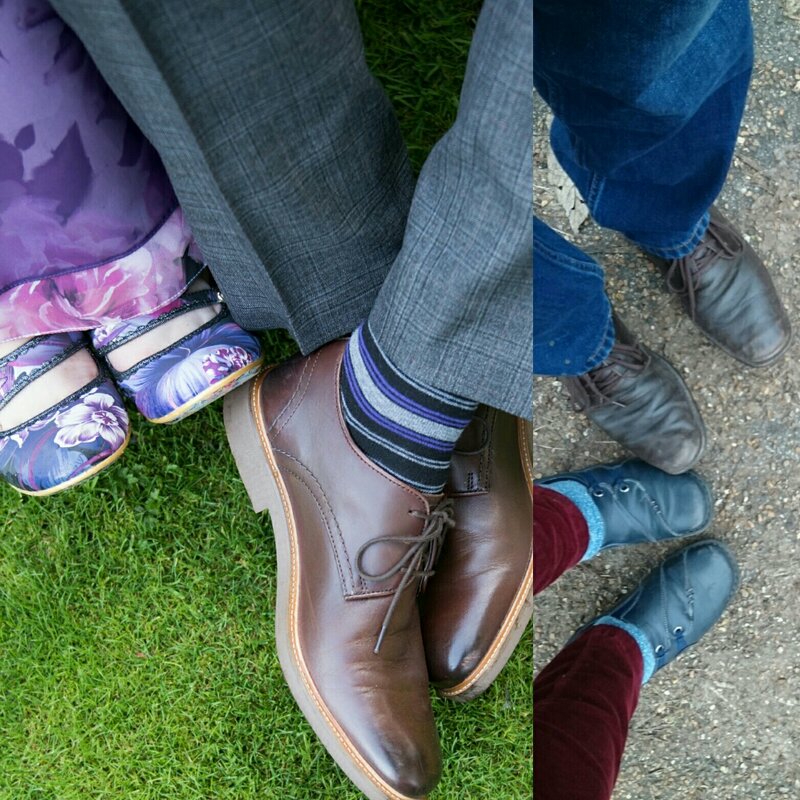 September has been a hectic month for me in work, blogging and at home – In a good way though. It was our first wedding anniversary at the end of September 🙂 but more of that later on. There were a few reasons I moved website hosts, some were for practical reasons, to give me more options to develop my website and writing and I really wanted a more interesting theme for my blog – to show off my photos. Also, I was worried I’d run out of room for photographs 😉 – an issue for some of my fellow gardening bloggers I think. I’ll be writing with more details of why I moved, how I’m finding it all so far with my new host company during October – Lyrical Host. Short answer is: all very good :-). I ‘think’ people are still getting notification of my new posts in the WordPress Reader and via email. But if you’re not, I thought it would be a good idea to give you an update, in case you thought I’d dropped off the side of the earth…. I have WordPress follow and like buttons on the new domain, and the design is similar, so I hope it is still familiar. There’s also an email subscription button, all my social media and RSS, bloglovin feeds. Any queries please drop me a line on social media (on right in sidebar) or via email – viewsfrommygardenbench at gmail dot com – including if you want to know more about moving website host. Here’s a summary about what I wrote about in September with links to the new content… do nip over and have a look 🙂 It would be lovely to see you – I’m looking forward to reading your comments. I joined Gabrielle Treanor (www.gabrielletreanor.com/) who writes about ‘worrying less, enjoy life more’ – for overthinkers like me. She runs an Instagram Photo challenge during September about pausing, being mindful and being in the moment. I need to do an update on this – I find photo prompts like this help me focus and reflect. One of the reasons I moved to Lyrical Host was because of the resources they provide – workbooks, stock photos, checklists and general support they provide. I’ve been joining up with Cathy (Rambling in the Garden) and all the gardening bloggers for over three years since the very early days of my blog. I can’t tell you how much joy it’s brought me and how much I’ve learnt about flowers, gardening and flower arranging too. I still tend to plonk the flowers, but I’ve learnt so much about flower arrangements too. Also, I wrote about making a pottery daisy for the garden 🙂 It’s not finished yet but I’m enjoying pottery very much indeed. The star of the show over the last few weeks is my neighbour’s Virginia Creeper which has gone from green to scarlet. I’m continuing to take photos as the leaves change so look out for my blog posts as we move into October. Here are my wedding shoes which will give you an idea of just how unconventional our wedding was – My Chap is awesome and he thinks I’m awesome too. 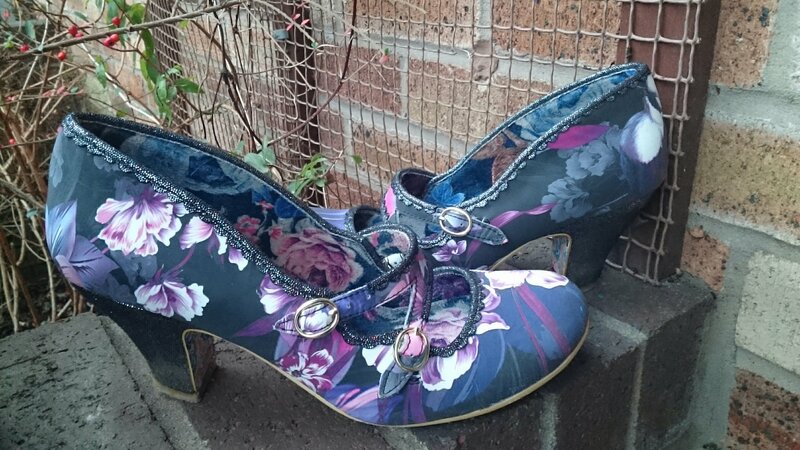 Purple floral candy whistles Irregular Choice. Oh and I’ve also been on a wonderful weekend away with my Women’s Institute buddies staying in a beautiful campsite in Cheshire owned by the Scouts. We stayed in a dormitory, with beside a small lake among the woods…at the bottom of the hill were colourful bell tents and a campfire. We had THE BEST time – crafting, chilling, laughing dressing up and also mindfulness, dancing and singing. This entry was posted in Life and tagged anniversary, blogging, In a vase on Monday, Lyrical Host, pottery, six on saturday, wedding, Women's Institute on October 4, 2018 by Bec - views from my garden bench. Spring is definitely on its way here in Manchester – I LOVE Spring, it lifts my soul. But,as usual the weather is due to change again, so I’m making the most of the sunshine. The snowdrops have been flowering for a couple of weeks, dwarf irises, crocuses too. I picked some along with some lavender leaves and flower spikes from last year. The vase is purple recycled glass I bought at the Eden Centre, in Cornwall. It’s appeared many times ‘In a Vase on Monday’. Do have a look at Rambling in the Garden www.ramblinginthegarden.wordpress.com/ where bloggers from around the world present their flowers; there’s such amazing diversity and skill. Many thanks to Cathy who hosts IAVOM – she has some stunning iris this week. It’s been a week full of love for us: it was Valentine’s Day, we always have a relaxed meal at home, unless we’re at a gig 🙂 As ever, My Chap bought me flowers, he does this regularly. I think he likes bouquets nearly as much as I do, but then he does work in the florist industry. There was so much love that day, and every day in their relationship, it’s wonderful to see. I wore my sparkly purple floral wedding shoes too 🙂 and Rebecca had beautiful wedding flowers #teamRebecca. I’m not putting any other pictures at the moment as they’ve not uploaded many – but their wedding cake was utterly awesome. Food as an expression of love – We’ve had lovely food this week too – pancakes with blueberry sauce on Shrove Tuesday, made by My Chap. I’ve got no idea how he made the sauce but it was lovely. We a sumptuous Chinese dinner to celebrate the ‘Year of the Dog’ but no photos as we ate it so quickly. My Chap would still love to have a dog but we will have to wait until we are retired…. fingers crossed a cat may be joining us later in the year. Here are some crocuses and pansys from our front garden – many more are on their way. What do you have planned to #savourhappiness this week? This entry was posted in In a vase on Monday and tagged crocus, In a vase on Monday, lavender, love, pancake, shoes, wedding on February 21, 2018 by Bec - views from my garden bench. ‘Joy comes to us in ordinary moments. We risk https://www.samaritans.org/missing out when we get too busy chasing down the extraordinary’ Professor Brene Brown, University of Houston – a social work academic with expertise in courage, vulnerability and empathy. It’s not #BlueMonday in Manchester, or anywhere else, today; it was made up to sell holidays and products. It did reminded me of Blue Monday by New Order, one of my favourite Manchester bands. Happy memories of gigs over the years too. But all the emphasis about negativity with ‘Blue Monday’ certainly doesn’t help people, so I liked the idea of #brewmonday promoted by the Samaritans (www.samaritans.org/)- have a brew with friends and talk. It has been raining heavily most of the day, but the clouds cleared briefly, so I dashed round the garden looking for flowers, the hellebores are showing no signs of flowering, there were just a few shaggy flowers on the perennial purple wallflower. 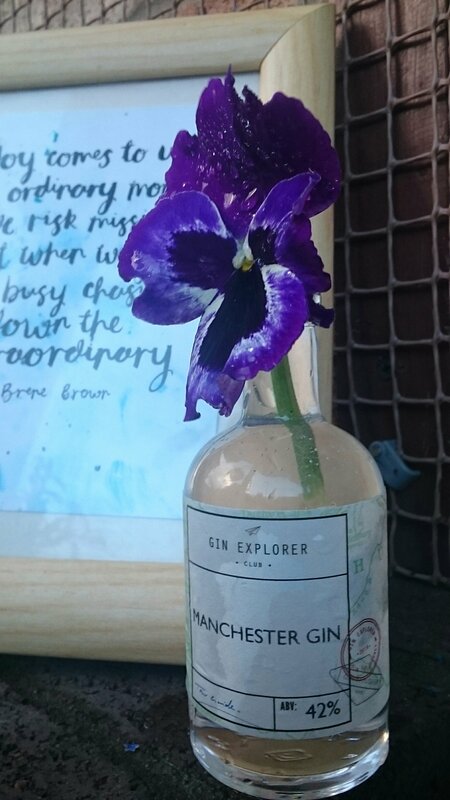 There was just a solitary viola tucked away – I decided to pair it with an small bottle which contained Manchester Gin, the flower still has raindrops on it. The quote jumped out at me too – sums up my thinking on looking for the positive in small moments. I try to look for the positive, in the small things in life, as well as the big things. I’ve had violas appear many times in my Vases on a Monday, we had violas at our wedding too. Oh and by the way, my favourite Manchester-made Gin is Manchester Raspberry – lovely especially with fresh raspberries obviously :-). Do have a look at Rambling in the Garden where Cathy hosts In A Vase on a Monday – where gardening bloggers from around the world add links to their vases. Always beautiful, interesting or unusual – including plenty of southern hemisphere bloggers who brighten my days in the depths of Winter here. We had are first meeting of the year at Cottonopolis WI (Ancoats, Manchester) I paid my subs, voted on the resolution shortlist, and heard about the activities for the year. It was lovely to see everyone and catch up on news. I didn’t finish my piece of bunting but nearly there – I’m very slow at sewing. I’m looking forward to more adventures #IamWI #InspiringWomen. I’m continuing with #selfcare, daily mindfulness, and yoga classes twice a week. I’m reading more about selfcare too. We’ve been walking every day despite the weather. DAY 14: JOY. There’s joy in the ordinary days (#onehouroutside a walk around our neighbourhood) and the unique days (our wedding day last year). But as Brene mentions, don’t just chase the extraordinary…. DAY 15: BEAUTY I chose the photos below, revelling in the beauty of flowers in small places and vast. I need time outdoors, in the garden, in the woods, in the wild countryside and by the sea. I’ve said this many times in this blog – it’s vital to my selfcare and my routine. 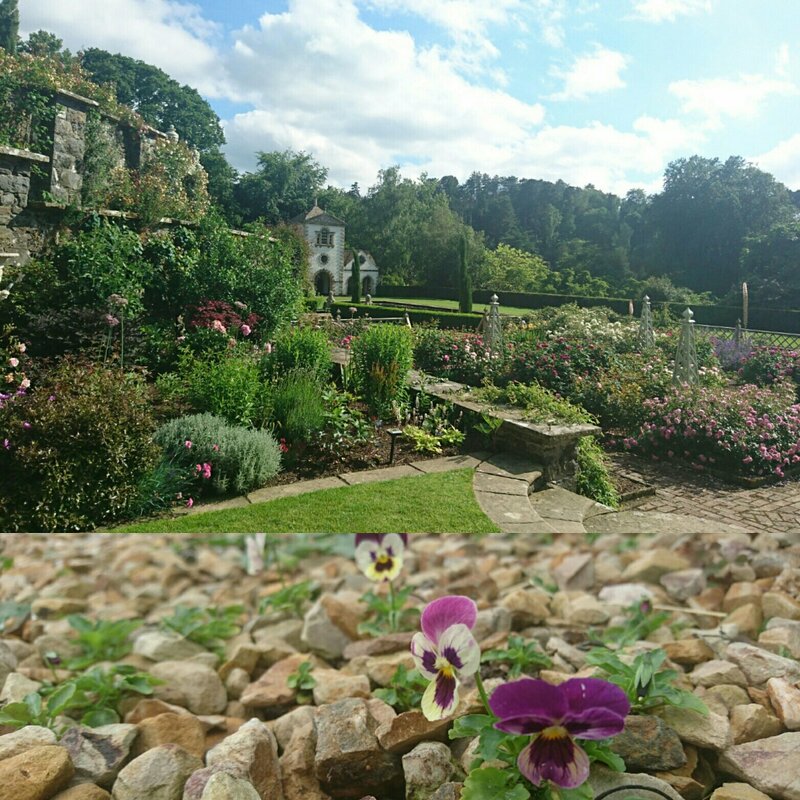 We visit Bodnant often; we got engaged there in June 2016 in the Rose Garden. Bodnant is owned by the National Trust. It is near Conwy, in North Wales. It’s a stunning garden anytime of year, with views over Snowdonia. I’m enjoying following #savouringJanuary2018 as it’s reminding me of what matters to me, goals and time to reflect. I’m still working on my CompassYear goals – small steps. It’s not too late to get involved in the photo prompts with Gabrielle Treanor on Instagram (@gabrielletreanor). See what I pick next… For Day 16: OLD….. The weather is looking horrible here in the North West so I don’t think there will be much gardening – but I’ll be crafting. This entry was posted in In a vase on Monday, Life and tagged Bodnant, bunting, gin, In a vase on Monday, savouringjanuary2018, Sewing, viola, wedding, Women's Institute on January 16, 2018 by Bec - views from my garden bench.